For the shopping week of Sunday May 3 until the close of business on Saturday May 9 in 2015, at Staples brick and mortar stores, you automatically get a $10 off discount if you purchase $50 or more in gift cards from GAP, Sephora and Spafinder. The purchase must be made in one transaction with a $50+ total. No coupons, no rebates, an instant discount at the cash register. But Chromebooks are not standing still, they are “countering” that at the eBay deals, with Acer’s Outlet Store on eBay offering the manufacturer refurbished 11.6″ Chromebook CB3-111-C8UB for $150 with free shipping, with a limit of five per buyer, and a 90 day warranty from Acer. It has 2GB RAM, 16GB on-board, and it is powered by a dual-core Celeron processor, with the usual 1366 x 768 resolution, and 2.7 lbs weight. On the budget laptops front, among the anti-Chromebook SSD-Windows 8.1 options, eBay seller “voodublu” (99.4%) is offering the manufacturer refurbished 11.6″ ASUS X205TA for $160 with free shipping, with 90 day warranty from ASUS. There are over 700 units available as of the time of writing. It has 2GB RAM, 32GB on-board storage, microSD storage (up to 64GB), quad-core Atom processor, battery life estimate of up to 12 hours, 2.2 lbs, etc. Smart and Final stores are back with another gift card promotion running from April 29 until the close on May 12 in 2015. If you purchase $50 or more in gift cards from the following brands (JC Penney, Michaels, Macy’s, Yard House, Cold Stone Creamery, and Jiffy Lube) in a single transaction, they will give you a coupon for $10 off your next purchase at Smart and Final. The coupon will print on the register receipt. If you shop at one or more of those places, this is a pretty good deal! Starbucks continues to roll out new offers to get people in the door. Between May 1-10 in 2015, they will have a happy hour that gets you half off the price of their Frappuccino blended beverages. The Happy Hour runs 3-5pm for everyone, but if you are a Staples Reward member, you get an extra hour, 3-6pm. Local times obviously. No coupon needed. More new phones on the horizon means more deals on previous models. Case in point, the 32GB LG G2, factory unlocked GSM, in new condition, in either black or white, is offered for $190 with free shipping by QualityCellz (99.2%) on eBay. Limit five per customer. No contracts! This is a 4G LTE (Band 1- 2- 4- 5 and 17) phone, with a 5.2″ display, 2.26 GHz quad-core processor, etc. Wow, this came out of left field at Stacksocial. A Nexus 5 Freedom Pop bundle! The good old LG Nexus 5 is offering without contract and with one year of free service from Freedom Pop for $200. This is a certified pre-owned with 16GB of on-board storage. See the details at the Stacksocial listing. This is the basic Freedom Pop free plan (up to 500MB of free data per month) with a trio of non-free features include for free for a year (tethering, visual voicemail, usage alerts). You own the phone right away, so you don’t even have to activate Freedompop if you don’t want to! This is last year’s Nexus device, with the Snapdragon 800, 2GB RAM (remember, this is pure Android, no skins to eat up memory), 1920 x 1080, Android 5.1, but sadly no microSD. 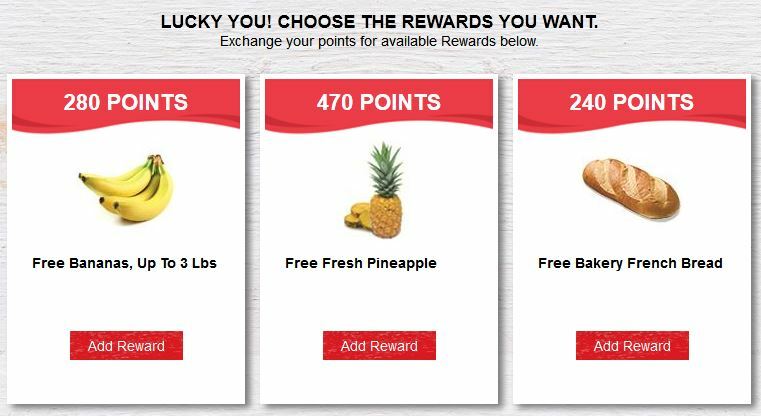 Interested in signing up for the Lucky’s rewards program but not sure what to expect? This post recounts my experience. I signed up using a computer and a web browser. They also have a mobile app (iTunes, Google Play). Smart and Final has a great everyday price deal. You get a 3lb rotisserie chicken for $6 total. There’s only one flavor and it has some mild spices. This is a pretty good deal, because most grocery stores have rotisserie chickens under 2lbs (typically 30oz) that sell for $6 or more. So you are getting a 50%+ bigger chicken for less! There’s no coupon, no weekly ad to pay attention to, no rewards program to sign up for. Just roll in the store and buy it! For the brick and mortar shopping week of Sunday April 26 open until the close of business on Saturday May 2nd in 2015, at Staples brick and mortar stores, you can get 25% back in Rewards on your purchases. Most items are eligible however, there are some exclusions (as is to be expected). The usual things are not eligible: Apple, Kindles, gift cards, phone cards, laptops/computers, tablets, Beats, Bose, Squaretrade, custom orders, and more. In other words, if you buy pens you are fine, but if you are buying big ticket low-margin items, they are probably not eligible. You must be a Staples Rewards member for this promotion. With so many flagship and flagship-level smartphones getting refreshed annually, more and more good deals are surfacing. Case in point, among the latest eBay Deals, you can get the manufacturer refurbished Motorola Moto X (second generation, AT&T Unlocked) for $250 with free shipping, with a limit of five per customer. The seller of record is “qualitycellz” (99.1%). This was an AT&T phone, but now it is an unlocked, GSM obviously phone. With “clean IMEI” per the eBay listing. Model XT1097. If you want to get the OnePlus One “budget-flagship” smartphone, but don’t want to play waiting list and invites games, your wish has now come true! OnePlus announced on its blog that you can now purchase the device from anywhere in the world straight up, no waiting lists and such. Just like you would buy a DVD on Amazon. Prices start at $300 (16GB) with the 64GB going for $350. There is no 32GB model, a move that Apple copied later on with its latest iPads/iPhones. Details at their blog. Good until the end of day 4/23/15, you can get T-Mobile SIM cards for just 99 cents each when you use coupon code SIM99 at the T-Mobile website. No contracts! You can keep them around in case of emergency number porting. Do note however that SIM cards have expiration dates. The critically-acclaimed movie “Unbroken” is now available for rental in HD for 99 cents at a number of high profile digital movie rental streamers including Amazon Instant Video and Vudu (in what they call “HDX”) and M-Go. If you have any store credits or promotional bonuses at any of those places, you can watch it for free. For example, if you are a Prime member and you chose slower shipping (instead of 2-day), you get a $1 credit added to your account that can be used on Video or MP3s or e-books.